Any experiment will involve a series of measurements and each of these will be made to a certain degree of accuracy. For example the calculation of a velocity needs both a time and distance measurement. Therefore errors and inaccuracies in each measurement will give a final error in the result. These are errors which are due to the apparatus and may result from either faulty apparatus, badly calibrated apparatus or a zero error. The only way to eliminate systematic errors is to re-calibrate the apparatus or change it! These are errors that are due to experimenter - in others words us! The size of these errors depends on how well the experimenter can use the apparatus. The better experimenter you are the smaller will these errors be. The way to reduce these errors, apart from simply being careful, is to repeat the readings and take an average. It is important to understand the difference between the precision of a measurement and its accuracy. It is possible to measure something to a high degree of precision (for example a mass to a milligram using an electronic balance) but still to have an inaccurate answer because the instrument used had an offset zero error. When you have made your set of readings you must be careful when you quote your result. You will probably use a calculator reading to eight digits to calculate and answer involving perhaps three of four quantities - do not use the eight digits - the accuracy of the final answer cannot be better than the accuracy of any of the single quantities. A word of warning here: small quantities may only be ignored in comparison with large ones. For example in an answer such as 5.4000003 the 0.0000003 may be ignored in comparison to the 5.4 and the answer quoted as 5.4 but this is not the case in an answer such as 0.0000013 where the 0.0000003 is 23% of the answer. 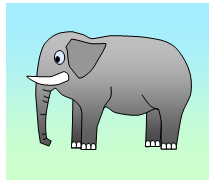 An Analogy: If you are sat on by an elephant it is not important whether or not the elephant has a fly on its back - you are still squashed flat. However to another fly the first fly is important! (i) Q is the sum or difference of a and b or (ii) Q is the product or quotient of a and b. Let the error in a be Δa and that in b be Δb. Then the error in Q is simply the error in a plus the error in b. 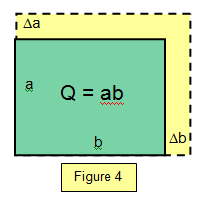 (ii) Suppose that Q is the area of a rectangle with sides a and b so that Q = ab (Figure 4). Let the error in a be Δa an that in b be Δb. and this is true whether or not Q is a product or a quotient. 1. Find the maximum possible error in the measurement of the force on an object of mass 4.0 = +/- 0.1 kg travelling at 5.2 +/- 0.2 ms-1 round a circle of radius 0.75 m +/- 0.01 m.
The equation is F = mv2/r. 2. Find the maximum possible error in the density of a material in the form of a cube if the mass can be measured to +/- 5 % and the length of its sides to +/- 3.4 %. You can see how, although the percentage error in L is smaller than the percentage error in mass, it is more important in the answer because it appears as L3 in the formula.